Brian Wansink coined the term, "Health Halo" when he was studying consumer behaviours when faced with healthier sounding front of package statements and restaurants perceived as healthier. Words like, "low fat", "low carb", while not formal health claims in terms of function, still have strong influence on consumer perception, ingestion and likely purchase. I couldn't help but think of Dr. Wansink's work yesterday when I read an article in the Big Food e-tradezine Food Navigator. The article detailed Kellogg's new cereal brand that they claim, "makes no health claims". One of my favourite blogs, Fooducate, covered this cereal a few days ago, but when I saw that, "makes no health claims" piece, I had to weigh in myself. The cereals, will be part of Kellogg's new FiberPlus Antioxidants Cereals and their launch comes right on the heels of the Federal Trade Commission's slap for Kellogg's suggesting their cereals improved, "Immunity". 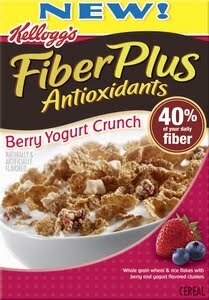 Want to take a guess at how many ingredients there are in their Kellogg's FiberPlus Antioxidants Berry Yogurt Crunch? I guarantee you'll be wrong. Here they are in all their splendor with the 12 different sugar sources highlighted for good measure. WHOLE GRAIN WHEAT, SUGAR, RICE, CHICORY ROOT FIBER, MIXED BERRY FLAVORED CLUSTERS (ROLLED OATS, SUGAR, OAT FIBER, CORN BRAN, CORN SYRUP, WHEAT STARCH, HONEY, YELLOW CORN FLOUR, CORN CEREAL, CANOLA OIL, NATURAL AND ARTIFICIAL FLAVORS, FRUCTOOLIGOSACCHARIDES, MODIFIED CORN STARCH, SOYBEAN OIL, SALT, CARAMEL COLOR, MALT EXTRACT, STRAWBERRY POWDER, CITRIC ACID, GLYCERIN, BHT [PRESERVATIVE], RED #40, BLUE #2, CELLULOSE GUM, GREEN #3, BLUE #1, RED #40 LAKE, BLUE #2 LAKE), MODIFIED WHEAT STARCH, SOLUBLE CORN FIBER, MALT FLAVORING, SALT, ROLLED OATS, FRACTIONATED PALM KERNEL OIL, INULIN, OAT FIBER, NONFAT DRY MILK, CORN BRAN, MODIFIED CORN STARCH, GLYCERIN, WHEAT STARCH, CORN SYRUP, HONEY, APPLE PUREE CONCENTRATE, YELLOW CORN FLOUR, STRAWBERRIES, BLUEBERRIES, VITAMIN A PALMITATE, NATURAL AND ARTIFICIAL FLAVORS, KIWI JUICE CONCENTRATE, WHEY, MONOGLYCERIDES, SOY LECITHIN, CORN STARCH, NONFAT YOGURT POWDER (HEAT TREATED AFTER CULTURING), CANOLA OIL, INVERT SUGAR, STRAWBERRY JUICE CONCENTRATE, ASCORBIC ACID (VITAMIN C), CINNAMON, FRUCTOOLIGOSACCHARIDES, RED RASPBERRY JUICE CONCENTRATE, GUAR GUM, BLUEBERRY JUICE CONCENTRATE, NIACINAMIDE, MALT EXTRACT, CARAMEL COLOR, CITRIC ACID, VITAMIN D, ALPHA TOCOPHEROL ACETATE (VITAMIN E), BHT (PRESERVATIVE), PYRIDOXINE HYDROCHLORIDE (VITAMIN B6), RIBOFLAVIN (VITAMIN B2), THIAMIN HYDROCHLORIDE (VITAMIN B1), BETA CAROTENE (SOURCE OF VITAMIN A), FOLIC ACID, VITAMIN B12. So what does 82 ingredients including not 1, not 2, not 3, not 4, not 5, but 6 different artificial colours (including one that now has to have a warning label slapped on it in the EU) buy you nutritionally? And a smattering of vitamins including some "antioxidants"
Kellogg's of course isn't stupid. They're simply expecting consumers who don't take the time to think about what they're eating and read food labels to be saying, "you had me at antioxidants" when they walk down the cereal aisle. Sure, there's no formal health claim, but that doesn't change the fact that this Frankencereal is banking on the words "FiberPlus" and "Antioxidants" to serve a health halos whose job it is to dupe you into thinking that what's in the box is good for you, which it probably is.....if you're a shareholder.